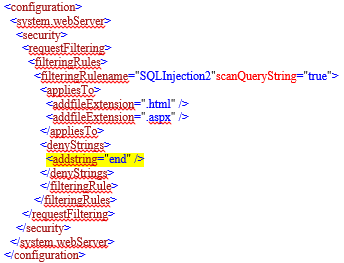 European IIS 10 Hosting - HostForLIFE.eu :: How to Block SQL Injection On IIS 7 And Later Versions? The discussion is specific to IIS 7 and later versions. Let's start with version IIS 7.0. It has a built-in feature that is able to filter HTTP requests. If a request is found to have contents which are unacceptable to process the request, then it will block such request there, before proceeding to process a request by a web application. 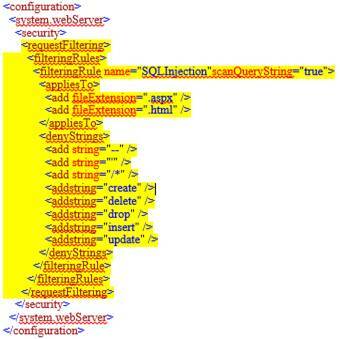 This feature is useful as a mitigation technique, for such SQL Injection vulnerabilities. At first, verify the IIS version that you are using currently. If you are using earlier than IIS 7.0, then update with the latest version before applying the following configuration. It will open the applicationhost.config file. In the applicationhost.config file, identify <requestFiltering> section. Under this section, configure for the reserve keywords or reserved special characters, like DELETE, CREATE, UPDATE, INSERT, --,',/* etc. in <denyStrings> section. Now, to save the file, go to the File menu and choose Save option. How does the above configuration behave in the IIS server? With the above configuration settings, first of all, IIS will look at each incoming request for pages with .html, .aspx, or .asp extensions, to search for specific strings in the request's Query String. If the IIS server finds the specified strings, then IIS will block the request and return a 404: Not Found page to the client. If you want to add a new file extension or change the existing file extensions in applicationhost.config file, you can add/remove the required file extensions in file Extension tags which lies in the <appliesTo> section. Whatever strings you are placing in the <denyStrings> section, the IIS looks for those strings. If it finds those, then it will block the request and return 404 error page to the client. You can add a new string, remove the existing string, or change the existing string, in the <denyStrings> section. In fact, in IIS server, you may have hosted many web applications which are running in parallel. Let's say, for one of the web applications, you don't want to deny any string for the incoming request. How will you handle such a scenario? Step 1: Remove the <add string="end" /> entry from applicationhost.config file. Make a note -- the name for the filteringRule tag must and should be unique and it should not conflict with a name which is in the applicationhost.config file or/and the same name with any other web.config files in the path. And, it is also possible to limit the scope of filtering rules using location tags. You can check the SQL injection attempt logs in IIS W3SVC logs section. filteringRule rejects such SQL injection attempts and responds with a 404 status and with a substatus 19. You have to check these logs periodically to make sure that your rule is blocking such SQL Injections for the legitimate requests.